The main introduction to Customer Focus Standard & Ultimate is a new module called the Production Planner. This was a piece originally designed to work for Embroidme Franchisees who decorate garments in-house however for this release it has been re-worked for everyone’s use. b) In production externally - for example the decoration is being done by an external party. The following screenshots provide further details about how people use it within the system. 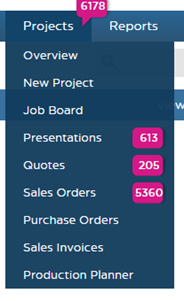 This screen shows a list on outstanding orders that are either pending production or moving through production. They are deliberately ordered by Due Date and can be filtered in different ways, such as internal or external, Due Date, Imprint Method or Sales Rep.